After 4,600 miles on the road from Miami, I arrived at Johnson Crossing at 2:27pm on Tuesday the 6th. OWWWWWW! I crossed the bridge and let out a big howl that made the flagger jump. When I went over to the lodge, I was met with a bag of lemon tarts from JC owner Cindy Murray. The Rolands has been through here and told her they were my favorite. After stocking up with supplies in Whitehorse on Wednesday, June 7th, I was joined that evening by Elaine Brummett. Dottie Demark, and Bob Ward from Skagway, Pat and Jim Healy from Marsh Lake, and Trevor Twardochles, and Jason Bilski from Whitehorse. Jeff Brady drove over with the canoe early in the morning and we started loading up the 17' Clipper Ranger donated by Kanoe People. I'll have it all the way to Dawson. Jeff will catch up with me at Carmacks Monday-Tuesday and paddle me down to the City of Gold. From there, I switch to a solo Clipper for the rest of the river. Thanks to the Klothes Rush for the tent and sugarless candy, Mountain Shop for dry bags and assorted stuff, Jeff Brady for the maps and fuel, Monica Carlson, Wendy Anderson, and the City of Skagway for their cards and letters of support. I finally hit the river at 11:36 a.m. Beautiful clear day, the wind at my back, two eagles soaring high. 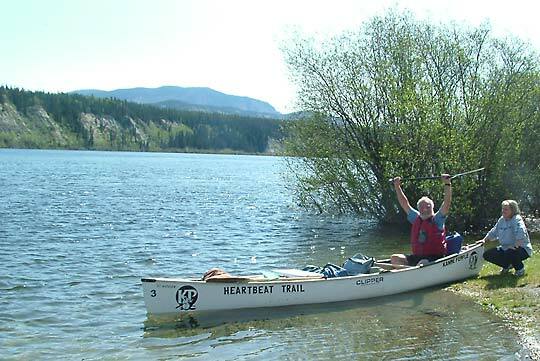 Buckwheat raises his paddle as Dottie Demark pushes him off on the start of his river journey to the Bering Sea at 11:36AM June 8th, 2006.